In Cell Era, Timepieces Are Fashion Trend To Watch With cellphones nearly ubiquitous, fewer people are relying on watches to tell time. But some retailers are doing brisk business marketing watches as fashion statements, or by appealing to shoppers' sense of novelty or nostalgia. Cellphones were once simple tools for making calls on the go. But the phones have quickly become all-purpose devices, used to send email, read articles, find restaurants — and tell time. And as more people carry that tool in their pocket or purse, fewer are relying on wristwatches to keep on schedule. Monica Espitia is one of them. "Since I've had a cellphone, I pretty much stopped wearing watches," she says. "Until I went on vacation and I didn't know what time it was." Now, it's after 5 p.m. in Manhattan's busy SoHo shopping district, and Espitia is rushing to find a watch. With a trip to Bali approaching, she says she's realized it's time to break down and buy a watch again — her first such purchase in 10 years. Espitia is not alone in sporting a bare wrist. Watch purchases have been falling for years. According to consumer research firm Experian Simmons, only 42 million Americans bought a watch for themselves in 2011, down from 55 million in 2004. Meanwhile, more than 90 percent of American adults now own a cellphone. But the watch industry isn't dying. Some retailers are actually stocking shelves with more of them. In any American Apparel retail store, shoppers will find rows and rows of watches tucked among pastel-colored sweatshirts and boyfriend shorts. One Manhattan store boasts at least five different displays of watches: prim and simple, gold and bold — even Casio calculator watches. The retail chain didn't even start selling watches until just a few years ago. But the company, which has struggled in recent years, was willing to experiment. So American Apparel found some colorful novelty watches that were popular decades ago, and tested selling them. "People flipped out when they saw them," says creative director Marsha Brady. The company quickly realized its tech-crazy customers were craving a sense of nostalgia, and were eager to snap up watches that remind them of styles from their childhood. "One of the most popular things we hear when people are looking at the watches is, 'Oh my god! I used to have that watch!' " Brady says. "I think that's what draws people in initially. Vintage is a really big part of our aesthetic." 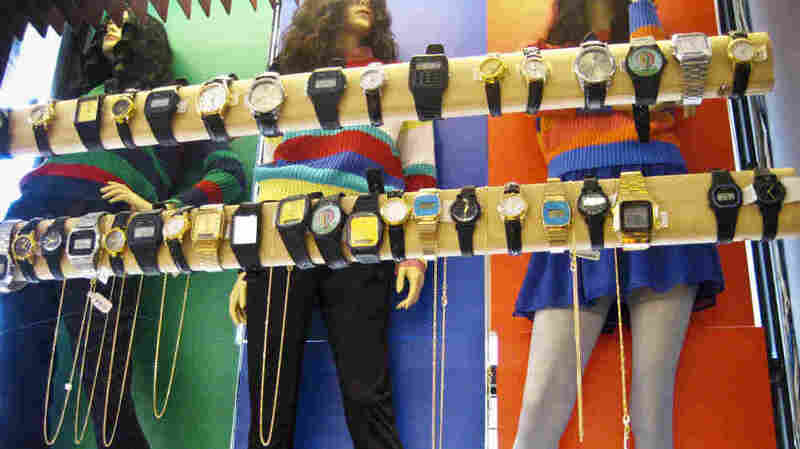 American Apparel has since scoured the country for watch styles no longer in production. The company sold 84,000 watches in 2011 — the same year the iPhone released its latest model. Brady says the retailer projects sales will climb 30 percent this year over last. Max Kilger, an analyst for Experian Simmons, says savvy retailers are finding there's still a market for watches — if they approach consumers the right way. "With the increase in smartphone usage, it's caused the watch industry to ... shift away from utilitarian watches towards more fashion statement watches," he says. In other words, people — even young people — are still buying watches — just not to tell time. They're instead using the timepieces to project their tastes, be it classic, retro or street style. Watches have always been considered statement pieces in the luxury market, and today, that market is booming, too. Auction house Sotheby's made its second-highest watch sale ever in April — nearly $13 million. Back at American Apparel, 21-year-old fashion student Taylor Trentini says she always wears her big, gold-plated watch. "It's very much a fashion thing for me, but now it's a habit," she says. "If I'm not wearing it, I feel lost." And she even uses it to check the time, once in a while.